March was National Athletic Training Month by the National Athletic Trainers' Association and in Pennsylvania that was officially the case thanks to Representative Scavello and Senator Tomlinson. During this past month of March, Athletic Trainers (AT) across the Commonwealth celebrated in many ways; all activities had the same goal of promoting athletic training, helping others, and educating people. “We started meeting with the students a number of years ago and believe it is a very important for the future of our Society to encourage the students to get involved early in their career,” Dr. Yvette Ingram, President of PATS. March was designated as National Athletic Training Month by the National Athletic Trainers Association. Athletic Trainers (AT) around the country plan projects to promote the profession of athletic training. Projects range in size from small newspaper articles and bulletin boards to billboards next to highways. The national slogan for March 2014 was “We’ve Got Your Back” meaning athletic trainers are there to keep the physically active healthy. Regional representatives of the Pennsylvania Athletic Trainers’ Society (PATS) Executive Board held continuing education events in their geographical areas. Topics at these events ranged from proper lifting techniques, the latest concussion research, cardiac issues in the athlete, nutritional needs, and how collaboration with school nurses works well in the secondary schools. As licensed health care professionals, ATs are required to complete continuing education in order to keep their credentials. Local events like these help to promote the profession and forge relationships with other health care providers. A total of 17 continuing education credits were offered through these events. At these same regional education sessions, donations were accepted to help fund the Pennsylvania Athletic Training Political Action Committee (PAT-PAC). The PAT-PAC was established for political purposes so that contributions can be made to candidates running for state office. These also allow AT to have a present in Harrisburg and attend special events such as Clam Bakes and Golf Tournaments. On February 28th, a bus full of students from Athletic Training Education Programs in PA headed to Rockefeller Center to the Today Show. This initiative was started by Stony Brook University in New York. This year, PATS wanted to assist their efforts by helping to sponsor a bus for students to easily get into the city. This was a great experience for students as they were on television promoting March as Athletic Training Month. Dr. Scott Dietrich from East Stroudsburg University accompanied students from East Stroudsburg University, Lock Haven University, California University of PA, and Temple University to the Today Show. A unique project for athletic training month happened at the University of Pittsburgh-Bradford. The athletic training faculty and students set up an event to add people to the Be the Match registry list on Thursday March 20, 2014. The students spread the word around campus and the community. People who met the donor criteria, aged 18-44, fell into the weight allowances, and had no blood borne diseases, could be added to the registry. In four hours, 84 people were added to the registry. At this point, $850 was raised to go Be the Match. “Our goal was to have 50 people added to the registry and $1000 raised” said program director Jason Honeck. The donations are still being accepted via pledge cards and online donations. 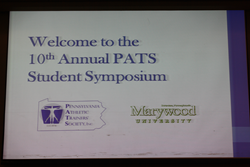 Finally, PATS ended March with its Tenth Annual Student Symposium. Nearly 200 students from Athletic Training Education Programs from across the state were in attendance at Marywood University. Students attended educational sessions about leadership, shoulder rehabilitation, therapeutic Pilates, heat illness, and low level laser therapy. Dr. Ellen Payne and Amanda Lippincott hosted an excellent event that allowed students to network with each other, as well as the Executive Board of PATS. “We started meeting with the students a number of years ago and believe it is a very important for the future of our Society to encourage the students to get involved early in their career.” Dr. Yvette Ingram, President of PATS. All of the various activities during National Athletic Training Month, as well as the PATS Student Symposium confirm our commitment to educate the public and our students about the value and necessity of the services we provide to the physically active in the Commonwealth.” John Moyer Jr., LAT, ATC, PATS President-Elect.